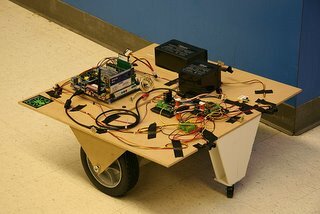 From Michael Shiloh: linuxrobots.org, a small wheeled robot runs around this guy's office and is available to be programmed by anyone who desires. Upload your linux code or modify code on the robot. You can watch the results of your efforts on the robot's webcam. So far I have not seen the robot move at all. This is a good idea. It would be nice to have a robot at your web-linked beck and call in some cool place like Disneyland or out on the street somewhere. Thanks for finding my project interesting. The robot sometimes gets jammed against my desk or dresser or something. Try to run in the other direction. Another common mistake I see is using too low a speed. The robot doesn't get going until the speed gets above 60 or so.